The annual Heart of the House Gala took place on September 11, 2014 at the Hyatt Regency Hotel in Birmingham, AL. Over 350 guest arrived to help Ronald McDonald House Charities of Alabama (RMHCA) celebrate 35 years of keeping families together. The evening included a dinner, silent auction, live auction and other fundraisers. 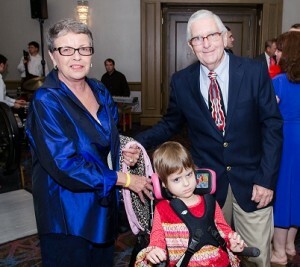 The guest speaker, Gene White, spoke about his experience at the Ronald McDonald House with his wife, Cindy, and great- granddaughter, Raylee. Check out his story and message to our supporters online here. He stated, “Nobody is immune. I hope your family never needs the Ronald McDonald House. But I want to tell you something. If you do, there is nothing like it. We thank God for it everyday.” We are very thankful for the $136,000 raised at the Gala. This money helps RMHCA continue to open the doors everyday to families just like the Whites. Families needing to travel to Birmingham for pediatric care and looking for a safe, affordable, home away from home so they can focus on helping their child heal. Thank you again to all of our sponsors, guests and volunteers for a wonderful evening.